The child is highly motivated during the first sessions of dolphin therapy which causes an escalation and activation of different modulations of the child’s brain. As a result more sensory information is received by the patient from all feeling organs, visual and auditory. After the bilateral contact between the child and dolphin is reached (generated) and the communicative resonance is established, the phase of common psychic and motor function (contact) begins between child and dolphin. 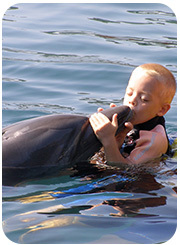 The therapist asks the child to do together with dolphins a row of structured exercises. Active contact with the dolphin comes into being from the throwing of a ball and receiving the ball from the dolphin, throwing above a rope or ring. Also one uses different playing objects, like a ball, ring or rope. Then different movements are practised in the water. The verbal and non-verbal contact with the dolphins exists constantly. 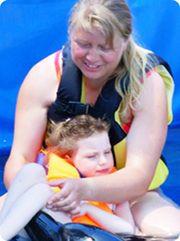 Every element of a practice is shown to the child by the doctor who is also in the water. Before the application of a dolphin as a co-therapist in the rehabilitation process, the dolphin is coached by a specially compiled didactic programme. Allelomimetrical behaviour (imitation) is unique to the dolphins. Their species are very curious and friendly and like to make contact with people. Because of their playfulness people are attracted to them and it is the task of the therapist to channel these traits and apply them to the therapy methodology. An important part of the Therapy programme are the sonic waves emitted by the dolphin which benefit the patient. Research results have proved that the dolphin’s sonic waves bear a direct relation to the improvement in the patients health. The sonic waves ‘massage’ the cells of the body and initiate a healthy exchange of potassium-calcium ions. The patient definitely undergoes a healing process. Swimming with the Dolphin is only productive when it is not spontaneous but controlled and supervised by the doctor. The therapist together with the patient and the dolphin perform a wide variety of exercises that lead to an improvement in the patient’s development and psychomotor capabilities. The structure is flexible so that each patient can be differently treated according to his/her requirements and medical profile. 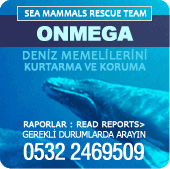 In our REHA-Center in Marmaris the patient attends a course of therapy under the best possible conditions. This maximises the synergetic effect of the psycho-corrective and therapeutic measures and enables the positive dynamics of the psycho-physiological state to be improved. At the end of the dolphin therapy new information is given to the members of the family for further home applications. The psychological effect and the concurrent induction of positive emotions between child and the members of the family promote other remedial processes. It is often the case that a child suffers a feeling of separation during a stay in a therapy clinic and this makes positive results difficult to obtain. This is not the case at our therapy centre. Not only is the closest member of the family present during therapy but also a further member.. The dolphin is treated as a member of the family.